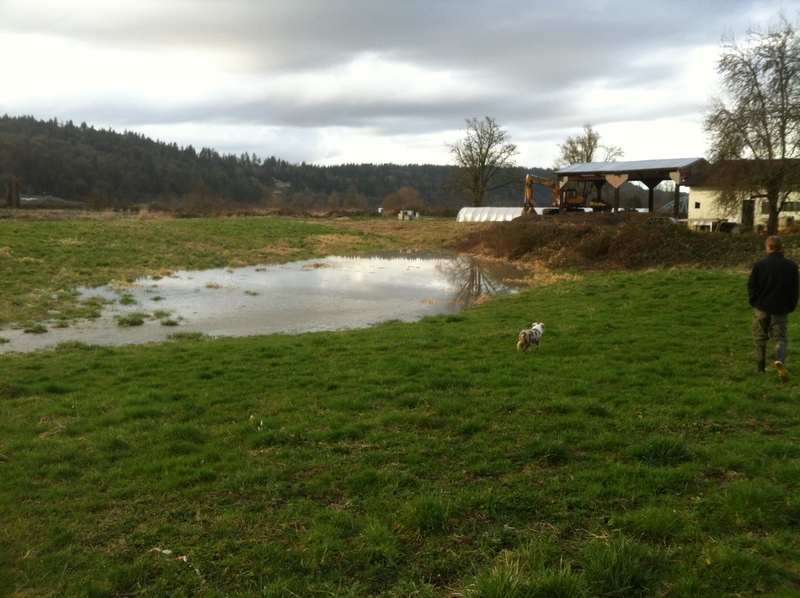 As I write this, the Snoqualmie River is flowing around all sides of our farm. There’s a lovely lake that’s appeared South of our home, and water is just reaching the fields we grew veggies in last year. I’m not sure how much higher the water is going to go tonight… could be a lot, or it could be just a little. The river forecasts for this flood have been a bit wonky. As of yesterday, they were predicting a 57.7′ flood. This afternoon, after the rain in the mountains had basically ended, they downgraded their prediction to around 55.5′. Then, throughout the day, they’ve been periodically raising the forecast: first to 56.3′ and now to 57.3′. In my experience, once they know how much rain has fallen in the watershed, their forecasts get more accurate throughout the event, as the water moves downstream. For some reason, that wasn’t the case today. The river is supposed to be cresting right about now at the Carnation gauge. But we are somewhere between 6-8 hours downstream of that gauge. So it should crest here sometime between 3 and 6:00 AM. What’s nice about this flood, is that being trapped out here on the farm, in a weird way, makes it easier to be productive. 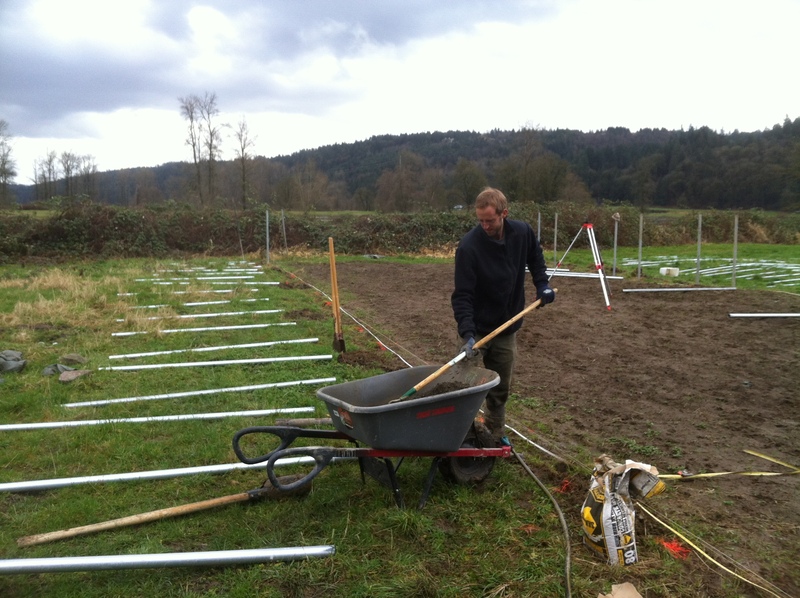 Our new manager Rawley is here with me, and we’ve been rebuilding the greenhouses that collapsed in the January snow and seeding flats. I should also have time to write some final thoughts about the farms we visited in Italy. I hope to have something to post on that front by tomorrow. Until then! on February 23, 2012 at 1:38 pm | Reply Jennifer C.
We’re about to head to Roma with our 13 month old. I would love any recommendations that you have for food and markets (favorite vendors etc.,) Looking forward to hearing from you! Hi Jennifer! While all of Rome’s markets are wonderful, they are not all true Farmers Markets. Most of the neighborhood markets have become entirely resellers. For a convenient daily market, I highly recommend the Esquiline market (near the Vittorio Emmanuelle metro stop). It’s every day except Sunday, and open until early-mid afternoon (not sure exact closing time). It’s super diverse, and offers produce and legumes/grains that you can’t find at the supermarket. There’s at least one direct market farm stand in the Esquiline market, sort of in the central room. You’ll recognize it by the dirt on the vegetables and the display of seed packets hanging up. For the real farmers markets, the easiest one to reach is near the north end of the Circus Maximus. It runs on Saturday, Sunday and Thursday, and I think is open until 2 or 3. There’s also a Saturday and Sunday farmers market in Testaccio, which is a little further afield (take the Metro to Piramide and then walk about 1/2 mile), but is set in a huge former slaughterhouse (ex-mattatoio) and offers a glimpse of a more “real life” Roman neighborhood. Links below are in Italian but should put you on the right track. Just look for the people carrying shopping bags bulging with produce! If you make it to the Testaccio market, please visit Paolo Giobbi and Mimmo (not sure of last name). As you enter the market, they are both on the right hand side. Paolo is about 2/3 of the way down and Mimmo is the last or second to last on the right. Tell them Siri and Jason sent you!